Mark your calendar: the MSDN Live Webcast about Industrial Automation Solutions is comming soon! The Windows Embedded family of products offers a broad range of embedded operating systems that have been deployed in demanding environments, and Windows Embedded operating systems will continue to drive the next generation of leading industrial automation solutions. If you interessted in, so attend this Live Webcast presented by Chris Muench on Thursday December 11, 2008 11:00 AM Pacific Time (US & Canada). Register now for the Windows Embedded Community Party in Barcelona! Click here before Friday 6th November 2008 to put your name down on the guest list for the Windows Embedded Community Party. This is your chance to connect with the Windows Embedded team, Windows Embedded Partners, your fellow developers and academic community in a chilled environment with food, drink and music! Save the date - and I'll see you there! 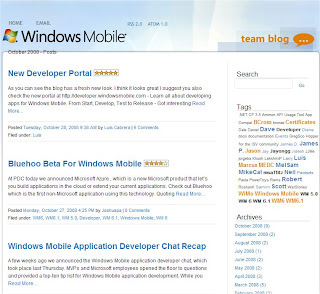 InfoBlast is a monthly ‘Must Read’ from the Windows Embedded Team and Partners. Subscribe here for the monthly newsletter and read the latest news from Windows Embedded and WEPP partners. Windows Embedded Distributor Abacus Deltron has set up a Windows® XP Professional Hotline to support embedded developers affected by Microsoft’s withdrawal of Windows® XP Professional from the royalty channel as of June 30th this year. "So, what has Windows® XP got to do with Embedded? ", you might ask. Well ever heard of Microsoft XP Professional for Embedded Systems? No? Well this is a package that is technically identical to the desk-top product in every respect except that the licensing terms are different. covering Windows Embedded CE and Handheld Solutions on November 6, 2008. This session will cover everything you need to know in order to build your next Handheld device. Windows Embedded CE is the ideal handheld platform with hardware support and software components to satisfy all requirements of the next generation of connected, service-oriented handheld devices. 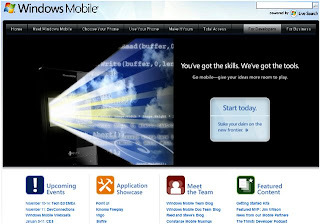 Quebec to be based on Windows 7! If you read the comment on one of my last posts on Embedded Standard, you know that I was expecting some news around "Quebec" soon, considering these eventful weeks. However, the news from Kevin Dallas - general manager of Microsoft's Windows Embedded business - during a Keynote at the ESC in Boston was not what I expected; but could prove to be the right step in developing Windows Embedded Standard forward. This announcement also answers Pats question if and when there will be a 64bit version of Windows Embedded POSReady - the successor of WEPOS. Kevin told attendees "Quebec" will not only provide OEMs with "exciting new input capabilities," such as multitouch, gesture support, and other user interface enhancements but also - at long last - be newly available in a 64-bit version. So when will "Quebec" be available? Rumor has it that the new desktop OS will be released to manufacturing in October 2009 and John Doyle - Microsoft Product Manager - noted that the embedded version, Quebec, will be available "within a number of quarters" after the desktop edition's release. Hence the time frame I assumed when answering Pats question seems to be a fairly good bet - only now with the better foundation! today, Version 3.0 of the .NET Micro Framework is to be launched during the Embedded Systems Conference (ESC) in Boston and at the Professionals Developer Conference (PDC) in Los Angeles. So watch out for news around this. The Windows Embedded Standard Team will be releasing a number of screencasts over the next couple of weeks to demonstrate the new features as well as some Tips&Tricks. - which you can find here: Windows Embedded Standard - A Look At Some New Features. shows you features such as the Enterprise macro, the Test Application Compatibility macro and new drivers. A little under 2 weeks before the Tech-Ed in Barcelona opens its doors to developers and I don't know about you but we (Harald and I) have got our bags and boxes packed and are ready to go. Something tells me that we will be lurking around the Embedded Area Booth B2 and we are looking forward to seeing you there. the latest Windows CE updates have been recently released and are available for download. Some critical issues (e.g. in kernel) have been resolved so get them now! More information for each update is provided in the Readme document available after the individual update(s) has been installed. Description: Download this set of updates for Windows CE .NET 4.2 Platform Builder released during the period of September1 - September30, 2008. These updates are fixes for Windows CE operating system problems you run into during the development and maintenance of your custom platform. 080911_KB957304 - NULL termination character may get ignored when user specifies -1 as the input string length. Description: Download this set of updates for Windows Embedded NavReady released during the period of September 1 - September 30, 2008. These updates are fixes for Windows CE operating system problems you run into during the development and maintenance of your custom platform. 080919_KB956579 - The MSN Direct Emulator sample DAT file was missing some source type content. When the custom rolls and SDK containing DBRLib.lib, linking against the library may cause a number of linker problems when using update versions of the compiler. Description: Download this set of updates for Windows CE 5.0 Platform Builder released during the period of September 1 - September 30, 2008. These updates are fixes for Windows CE operating system problems you run into during the development and maintenance of your custom platform. 080925_KB957639 - This update adds ASN1 decoder and encoder to address some issues related to certificate processing. 080911_KB957314 - NULL termination character may get ignored when user specifies -1 as the input string length. 080912_KB956452 - This updated allows more control over the audio device used by the DShow audio renderer. 080911_KB956296 - This update adds support of DRVM_MAPPER_PREFERRED_SET. 080910_KB957139 - SHChangeNotifyRegister and SHChangeNotifyDeregister may not work correctly when dealing with more than 1 registered HWND. 080930_KB958079 - Time Zone data are out of date resulting in DST transition time being wrong for some of the time zones. This update also adds a number of new time zones. Description: Download this set of updates for Windows Embedded CE 6.0 released during the period of September 1 - September 30, 2008. These updates are fixes for Windows Embedded CE operating system problems you run into during the development and maintenance of your custom platform. 080911_KB957315 - NULL termination character may get ignored when user specifies -1 as the input string length. 080925_KB956505 - GPE::EmulatedBlt_Bilinear may not reset the initial step value before each horizontal line stretch. This causes some visual errors in the resulting bitmap. 080919_KB956842 - Windows Vista's Network Projector is not able to connect to Windows Embedded CE 6.0 Network Projector device if none of the resolutions that it supports are part of capability blob. This update allows optional customization registry, for example, 800x600 to be send along in capability blob. This makes Network Projector connection succeed, however it does not change the resolution of the Windows Embedded CE 6.0 Network Projector. 080909_KB957302 - This update addresses an issue with slow registry flushing. 080911_KB956352 - The proxy call for QueryContextAttributes for SECPKG_ATTR_SESSION_KEY is missing the context handle from the invocation. 080911_KB957428 - Redir component may not always use Server Local time for file modification timestamp. 080930_KB958080 - Time Zone data are out of date resulting in DST transition time being wrong for some of the time zones. This update also adds a number of new time zones. As you might know, the standard way to SYSGEN a (PUBLIC) Windows CE component is to first build the <my_component>_lib.lib and SYSGEN it to the <my_component>.dll or <my_component>.exe. This, of course, happens in accordance to the respective SYSGEN_VARIABLE, which in turn is responsible for setting the corresponding MODULE (e.g. CE_MODULES). This module is then used in the respective MAKEFILE to build the corresponding .dll or .exe. The just described procedure works well if you SYSGEN the whole component but if you only want to SYSGEN the subcomponent you probably get an error that might read something like: “NMAKE : fatal error U1073: don't know how to make '<my_component>_lib'”. The solution to this problem can be found in _MAKEENVROOT\bldsys.bat: the attempt here is to match the MODULE in the sources file, the dirs file and the contents.oak file. If the MODULE is not found in either one, the TARGETNAME is used. So if you set MODULE=<modulename> (normally <modulename> equals <my_component>) in the sources file the SYSGEN of the desired subcomponent works without errors. The FLUSH\OSCAPTURE subcomponent of CELOG (_PUBLICROOT\COMMON\SDK\SAMPLES\CELOG) could be used as an example: SYSGENing CELOG works, but you get the above mentioned error when trying to SYSGEN OSCAPTURE directly. Microsoft has just released the successor to Windows XP Embedded (XPe): Windows Embedded Standard 2009; the embedded operating system for x86-based devices is now available to product manufacturers. You can find more information on Windows Embedded Standard here. A trial version will be available for download there soon as well. Instant SDK - Something you have always been looking for? How about the possibility of being able to develop an application for your OSDesign without having to create an SDK first or to write the application as a sub-project in PB? During my time as a Windows CE developer this was always something I had yearned for! If this is an option you would like to see in future versions then take a couple of minutes and add your comment to Mikes post here. as this is where you will find the Crème de la Crème of the Windows Embedded Team, Distributors and Partners attending the 2008 EMEA Summit from 7-9 October, 2008. Trust my luck to come down with the flu instead of being in sunny Monaco with the others. Windows Embedded CE 6.0 Book for free! 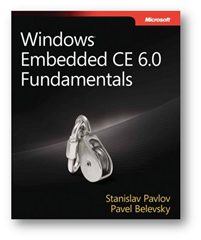 Download a free electronic copy of the new "Windows Embedded CE 6.0 Fundamentals" book from the Windows Embedded website! Log in here with your Windows Live ID, and download the PDF. Today I started to clean up a BSP and moved some COMMON directories to the new platform. In one directory I got the abovementioned build error. The sources file seemed to be ok. Also the sources itself were fine. But what the hell was it? A search in the web didn't bring the right hint. But an additional directory diff showed me what was missing: the "makefile". That's all. Grrrrrrrrr!